Serial Two-Photon Tomography (STP tomography), a new technology developed by neuroscientists at Cold Spring Harbor Laboratory (CSHL) and MIT, significantly speeds up the process of acquiring highly detailed anatomical images of whole brains. Until now, the process has been painstakingly slow and available only to a handful of highly specialized research teams. “The new technology should greatly facilitate the systematic study of neuroanatomy in mouse models of human brain disorders such as schizophrenia and autism,” says CSHL Assoc. Prof. Pavel Osten. Tomography refers to any process (including the familiar CAT and PET scans used in medical diagnostics) that images an object section by section, by shooting penetrating waves through it. Computers then produce a 3D rendering (of the brain, in this case). Two-photon imaging is used in biology laboratories in conjunction with fluorescent biomarkers to illuminate specific cell types or other anatomical features. The two-photon method allows deeper optical penetration into the tissue being sampled than conventional confocal microscopy. STP tomography achieves high-throughput fluorescence imaging of whole mouse brains via robotic integration of the two fundamental steps — tissue sectioning and fluorescence imaging. At 10x magnification of brain tissue samples, the researchers were able to achieve fast imaging at a resolution sufficient to visualize the distribution and morphology of green-fluorescent protein-labeled neurons, including their dendrites and axons, Osten reports. A full set of data, including final images, could be obtained by the team in 6.5 to 8.5 hours per brain, depending on the resolution. These sets each were comprised of 260 top-to-bottom (coronal) slices of mouse brain tissue, which were assembled by computer into 3D renderings capable of a wide range of “warping” to reveal hidden structures and features. “The technology is a practical one that can be used for scanning at various levels of resolution, ranging from 1 to 2 microns to less than a micron,” Osten says. Scans at the highest resolution level take about 24 hours to collect. 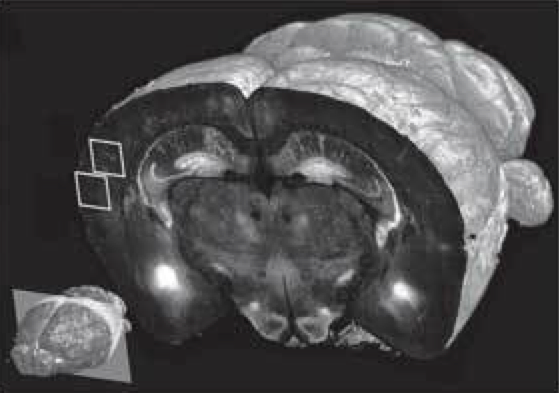 This makes possible an impressive saving of time, Osten says, compared to methods that are now in use, which would take an experienced technician about a week to collect a set of whole-brain images at high resolution.